There is nothing natural about the sky in the following photos. In both images the sky should be completely blue. Thanks to the spray planes (non-commercial jets), the atmosphere is often saturated with aluminum oxide, barium oxide, other metalic salts and more. Look up, learn, spread the message... let's get our blue sky back! Visit the videos page for a long list of documentaries and other informative videos to download or stream online. 2007 marked the beginning of “Patriot Presentations” in Bush-land. If this bill passes the Sentate free speech can be declared a form of "terrorism" and therefore a crime. Watch the video and take action! 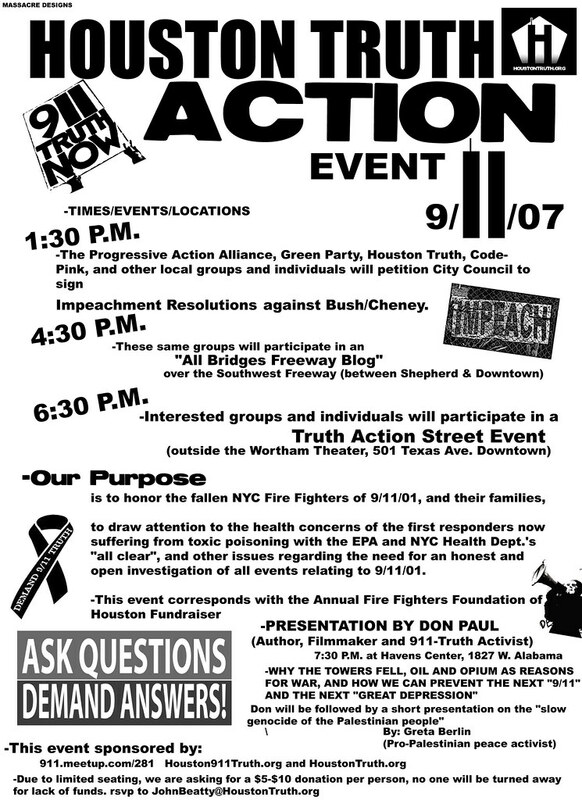 From city to city and around the world: Houston Truth helps spread an important message sent from Indiana to San Diego about the crimes in New York on 9/11/01. Message from V: "Take Back America"
"Wake up and commit to the Truth"
Thanks to a group of dedicated patriots, impeachment was on the docket at Houston City Council on July 10, 2007. Mayor White left the room. Council members also showed great disrespect for the anti-war activists who have been trying to make the world a better place for all. Michael Berry is worthless. John Beatty sings his song about "a dark day for our country." The true patriot then put up his guitar and headed into City Hall to speak to our local, crooked politicians about impeachment of Bush and Cheney. Before Thompson entered the building I was able to ask the Attorney General of Texas, Greg Abbott, why he considers Fred Thompson a “front runner” and a conservative.